Jamaican Beaches - each one has its own character. Absolutley not. Jamaican beaches come with different personalities. Some are the poster-perfect, white sand, hardly-a-ripple type of beach. A must see and swim. Others are windswept, with sands of colour. Some are well known for their scrumptious seafood. 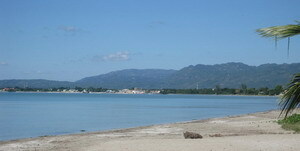 And some Jamaica beaches are not well known, and wish to remain that way. 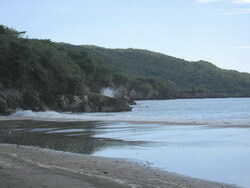 Secluded, romantic beaches. Beaches full of Jamaican vibes and laughter. Seeing Jamaicans on the beach can be a real lesson in Jamaican culture. It's a rare Jamaican who'll go to the beach and lie quietly in the sun for more than a short time. We like to play around on the sand and in the water, and since most of us don't know how to swim, there's often a lot of screaming involved! We like our beach mixed with music, ball games and a lot of splashing. And we're not very uptight about what we wear. The lack of a swimsuit will never stop a true Jamaican. Tights, T shirts, tank tops, boxers and bras are all acceptable beachwear. But please, please be respectful of our hair. When a lady announces "Don't wet up mi hair! ", you splash at your own peril. Here are some Jamaican beaches I think you might enjoy getting to know. I'll start with the beaches in St. Elizabeth. Located 5 minutes east of Fonthill, you'll have to turn off the main road and follow the minor road for about 3 minutes. That takes you to the fishing beach, where shell, rock and sea glass collectors may find items of interest. The picture shows a haul I made after just 20 minutes wandering around. Another 5 minutes along a marl road takes you to the far beach (in the picture). If there's been a recent party, there might be some plastics cluttering the way to the beach. The beach itself is totally undeveloped and usually deserted. A bit rocky in spots, but it's a long stretch of beach that's good for walking, collecting shells and driftwood. In the afternoon there is boisterous wind, and waves in which you can body surf. Best to go in a group, as it can be really lonely out there. Located on Crane Road, Black River. You can walk along this dark sanded beach for miles, heading southeast. Collect cockles by the dozens during March and April. Not at all crowded. Serene in the mornings, and good for swimming at that time. Don't swim close to the river mouth, as crocodiles occasionally venture out of the river, although I've never heard of anyone having an encounter in the sea. I swim much further up the beach. Adjoins Heavy Sands, and stretches picturesquely to Parottee Point. 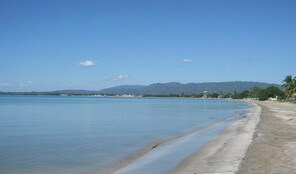 Stroll or swim undisturbed along a wide, scenic beach, with a view of the town of Black River in the distance. 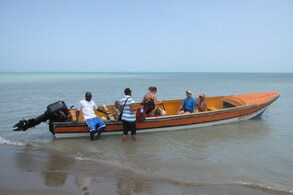 A short boat ride away from the popular Pelican Bar. Officially part of Treasure Beach, this secluded brown sand beach is actually quite far west from the other 4 bays which together comprise Treasure Beach. Occasional parties are held here, but for the most part it's quite deserted, and a good escape. Swim with caution - there's a strong undertow. These Jamaican beaches are all part of the community of Treasure Beach, each one with its own charm. I almost forgot that Alligator Pond isn't actually in St. Elizabeth. It's in Manchester, but so close to the border that we've almost adopted them! Rugged, black sand, fishing beach. Not much swimming, but very scenic, and is the home of Little Ochi, one of the most famous Jamaican seafood restaurants. Solitary and unspoilt, this is a charming spot on the south coast of Manchester. 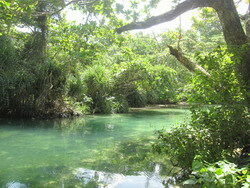 Although the sea is a bit rough and rocky, you can swim in the river, which is cool, clear and unrushed. A natural mystic sort of vibe, a few minutes drive east of Alligator Pond. 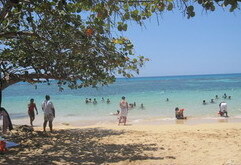 A real Jamaican beach, right along the roadside in Westmoreland. In the days of slavery this beautiful bay was a meeting point for ships sailing in convoy to England. 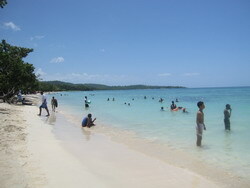 A celebrated seven mile stretch of white sand beach, touching 2 parishes, Westmoreland and Hanover. Lots of music, places to stay, bars, restaurants and watersports along the most vibrant of Jamaican beaches. If you spend a few days here and a few in St. Elizabeth, your vacation is made. A couple of days in Portland would be icing on the cake. In the deep green parish of Portland. An enchanting cove with a river running along one side. White sands bordering lush tropical vegetation. Like a romance novel. Powdery white sand, amazingly blue water, gets deep very quickly. A beach for swimmers. One of the most reknowned Jamaican beaches. Known for its seafood. "Festival", the famous side dish which accompanies Jamaican fried fish, originated here. This is perhaps the most urban of our beaches. Not at all touristy, it serves the people of Kingston and St. Catherine. Jamaica is blessed with many more beaches than those listed here. I hope you find your perfect match when you come to visit us. You're allowed to have more than one favourite!